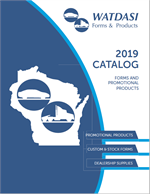 Welcome to WATDASI Forms & Products, a division of Wisconsin Automobile and Truck Dealers Association. We supply automotive and truck forms and supplies to dealers and non-dealers, in-state and out-of state customers, commercial and residential addresses; shipping to the 48 contiguous states. We strive to provide dealers with sales, office, service forms and sales incentives. In addition, we offer a full line of promotional products and wearables; mugs, air fresheners, ice scrapers, shirts, jackets, key tags and much more. Online Orders: ONE PRICE SHIPPING - order one item or one billion! Special One Price Shipping of $12.75 on each online order for most items. Residential surcharges are not included in One Price Shipping and will be charged in addition to the $12.75. Prepaid orders with residential surcharges will be invoiced for the surcharge.